Sometimes, you just need the perfect mascara to top off the amazing look that you’ve put together. We’re here to help you get started! We’ve done our research in order to bring you the top ten tube mascaras to help you look even more amazing! These mascaras are also great for your natural lashes. Before you start shopping, here are some things that you should know about these tube mascaras. Color: Most mascara comes in black or dark black formulas. If you want something a bit more colorful, you can also find dark blue, and a softer, natural brown or dark brown as well. Choose your favorite! Package Size: How much product are you getting? Keep in mind a little mascara goes a long way when you’re checking out the package size – it might not seem like a lot but it will last forever. Hypoallergenic: Hypoallergenic formulas are gentler on sensitive eyes, and won’t irritate certain allergies that other mascara or eye products might. 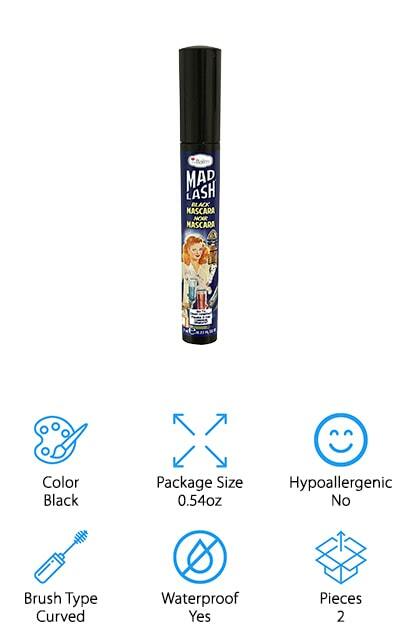 In case you need a mascara that doesn’t trigger an allergic reaction, we’ve included this helpful information. Brush Type: There are a ton of different brush types for mascara. Bristle brushes are the most popular, followed by curved ones. The wands come in all different shapes, and some even include plastic or synthetic bristles. Waterproof: Waterproof mascara won’t streak the moment that moisture hits it. Most can persist through tears and rain. If that’s something that you’re dealing with, choose waterproof formulas to keep your lashes looking great no matter what. Pieces: How many tubes come in the package? There are a few products here that come in helpful two-packs for sharing or keeping mascara in different locations. It can also help you rationalize the price of the product. With all of that information under your belt, we can get to our best tube mascara reviews! All of these great products will make your lashes look great and add a boost to just about any eye makeup look! They each have their own special effects and abilities, so make sure to choose the one that suits you. Our top pick and budget pick are highlights to get you started. This Extreme Lash Mascara by stila is extremely lightweight while still offering amazing volume. It’s a deep black shade that they describe as ‘ink-like’, so you know that it’s going to absolutely cover your lashes and give them some great definition. It’s made of a blend of waxes that you can build up for dramatic lashes that are still soft, flexible, and not stiff at all! Plus, it won’t weigh down your lashes. You won’t be able to feel it! The wand has multi-length bristles that are crimped in order to grab every one of your lashes and coat them with color. 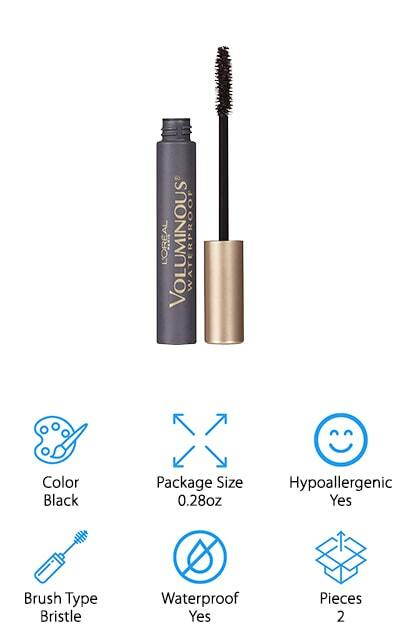 This product comes in first on our list because its effects are even better than competitor’s volume formulas, including orange tube mascaras and yellow tube mascaras. We love the design of the wand, too – it helps to make the mascara perform at its absolute best. Even better, this mascara helps to lock in moisture. We absolutely had to include this product in our tube mascara reviews! This is the classic Maybelline tube mascara that helps to double your lashes and go on super smoothly. It helps to condition your lashes, so it also works to help your natural lashes feel better. It’s waterproof so it won’t come off easily in the rain. Even so, it’s easy to remove without scrubbing when you want to get it off. The bristles on the wand help to saturate every one of your lashes in this ‘Very Black’ formula for a great look that emphasizes the beauty of your natural lashes. It’s available in brown as well if you’re aiming for a softer look. 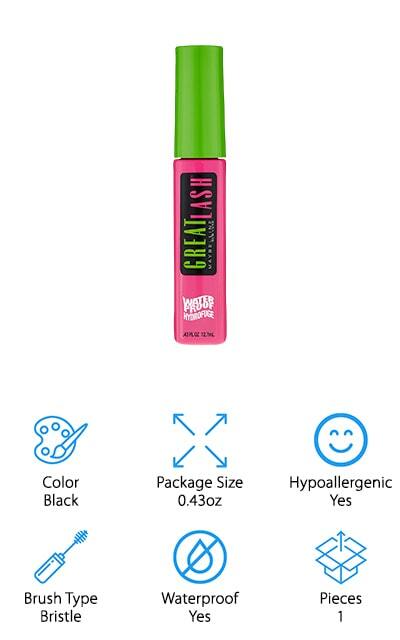 One application of this green tube mascara will get you all of the volume that you want for natural looks or everyday wear. Plus, the formula is hypoallergenic so it’s great for people with sensitive eyes or contact lenses. theBalm Mad Lash is unique on our list for coming with a curved brush. It’s a lesser-known brand that still delivers the volume that you want! This purchase comes with two tubes of mascara, so it’s great if you want your friend to try it or you think you’ll go through the first tube fairly quickly. They are both full-sized mascaras that will give you intense, defined lashes that go well with any look. It’s a deep black formula to add drama to any look, from a full face to natural eye makeup! The wand is injection molded and curved so that your lashes get a nice enhancing boost. Plus, the formula is buildable for an even more dramatic look. Tired of your mascara flaking off? That one won’t so build to your heart’s content! We love the packaging and that it comes with two full-sized products. You won’t need to repurchase for a while! 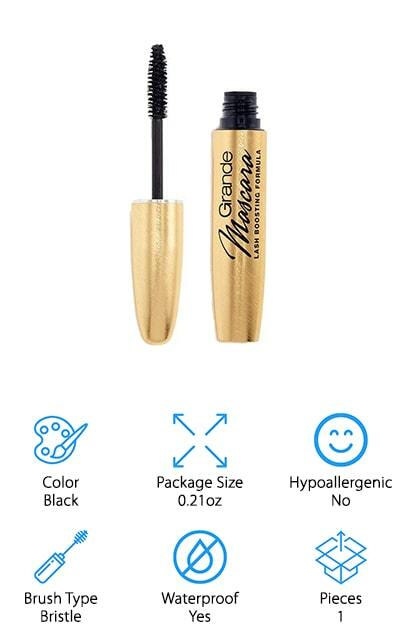 This gold tube mascara from Grande is rich and luxurious. Lash Junkie boasts a formula that can help you get a faux lash look without having to apply them! Your natural lashes are the canvas for this mascara! It’s infused with natural waxes and peptides in order to help your natural lashes look healthier and better-conditioned when you take the mascara off. It’s easily removable, so you won’t have to scrub at your eyes and risk breaking your lashes. The formula is water-resistant and will stay on your lashes through rain and other mildly wet conditions. It won’t lump or clump and keeps your lashes from getting stiff. Over time, this unique formula will not only provide you with amazing looks, but it will also help your lashes shine when it comes off! It’s a lightweight formula that’s free of parabens and safe to use with contact lenses. As a bonus luxury, this mascara is made in Italy! 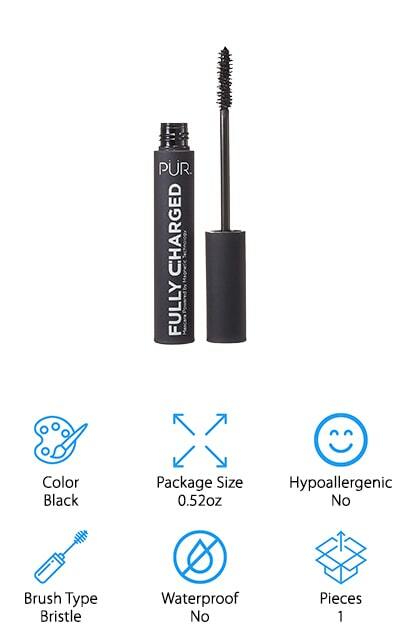 PÜR makes this amazing magnetic mascara. It uses technology to lift your lashes up by means of an elastic veil with a positive charge. Your lashes separate away from each other, so there is no way that you’re going to end up with clumps or stuck-together lashes. It also includes provitamins like B5 to help your natural lashes strengthen and get some much-needed conditioning. It’s good for your lashes and your look! 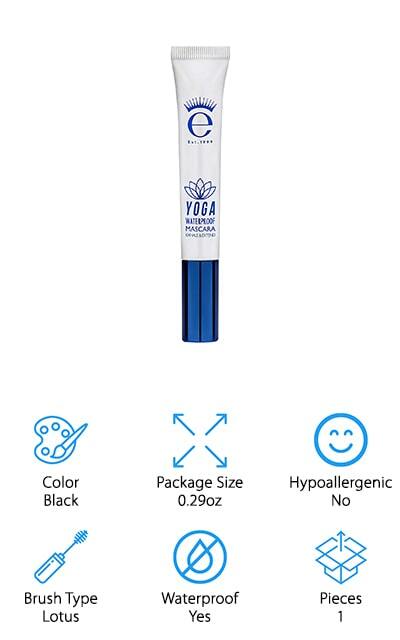 It’s marketed as anti-aging mascara because that’s what it does to your lashes. They will feel great! Plus, you get the maximum volume possible through science and technology! What more could you want? Each of your individual lashes will look thicker and longer without damaging them in the long run. Plus, the formula also includes Carnauba and beeswax to help keep your lashes looking good for long-lasting wear. 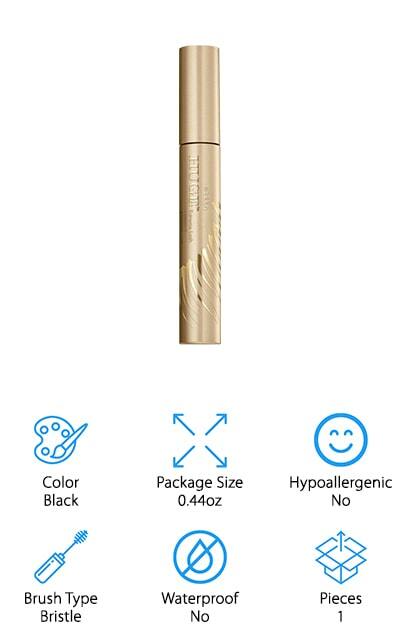 This mascara is something new and unique, and we are sure that you’re gonna love it! Lashboss by Laura Geller is an amazing mascara that’s full of great things. It’s made with keratin to help keep your lashes strong and moisturized. This works together with curling peptides (so you don’t have to curl your lashes first) and collagen to help get you thicker-looking lashes. This mascara does it all – from lengthening, to thickening and adding volume as well as curling when it’s applied. The brush is dual-sided, with shorter bristles on one side and longer bristles on the other. This allows you to fully customize every angle and aspect of your lash. It’s full of protein to help your natural lashes out, too. The formula won’t clump or flake, so you’re left with great-looking individual lashes that are going to boost the power of your look. Use it every day for healthier lashes or just for a special occasion for great volume! We know that you’re going to love it just as much as we do! 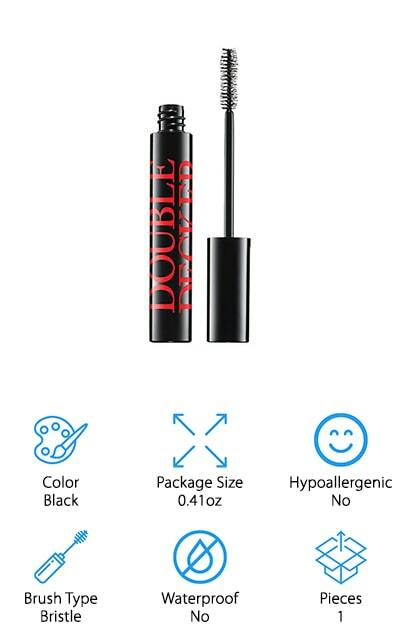 butter LONDON’s Double Decker Mascara is great for making your lashes look fuller, longer, and curlier! This amplifying mascara has a fiber bristle brush that helps to grab and coat every one of your lashes, making it look like they have multiplied. Who doesn’t want that? The mascara itself has a lightweight feel and creamy texture to make your lashes feel great. The emulsifying system also helps to moisturize your lashes and keep them soft and flexible. This mascara is dramatic and beautiful. Our favorite part is that it makes your lashes multiply right before your eyes – instantly and with a single application. 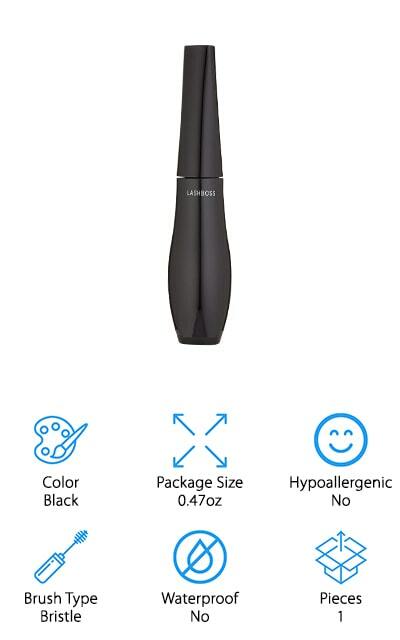 The brush has enough bristles to get all of your lashes at once. It comes in black, which will help add drama to your everyday look as well as special occasion looks. We especially like the extreme curl technology, which adds dimension and height to your lashes without using a curling device first. We couldn’t create a guide without including an L’Oréal tube mascara review. This Voluminous mascara by L’Oréal Paris is entirely waterproof, so you can use it on rainy days without worry. It separates your lashes and builds them up, increasing up to four times their natural thickness! It doesn’t get much better than that. It’s full of dark black pigment and helps your lashes look more dramatic with just one application. Plus, it applies evenly so that your lashes are smooth and pigmented at the same level all the way across. It won’t flake off, and won’t smudge or clump either once it’s applied. It’s formulated with hydrating agents to help protect your natural lashes. It’s ophthalmologist-tested and hypoallergenic as well so your lashes underneath will feel great once you take it off. It won’t leave them stiff, either! We love the way this mascara boosts your lashes as well as helping to keep them hydrated. Eyeko makes this waterproof mascara and’s a little bit different to the other mascaras on our list. The brush is a lotus-shape, which is a bit like a normal pinecone brush with a more flared base. This brush helps to extend your lashes, lift them, and curl them all at once. It’s designed specifically to help the lashes at the outside corner of your eyes look longer and more dramatic. It’s great for daily use! In addition, it’s infused with green tea, fruit extracts, and Vitamin E to help your lashes feel and look better the moment that you take it off. The straight tip will help you catch shorter lashes and get them the same color treatment as the rest of your lashes. Plus, it’s great for wear all day long. With this on your lashes, your natural lashes will thrive. It’s a great perk in addition to supplementing great, dramatic eye makeup looks. 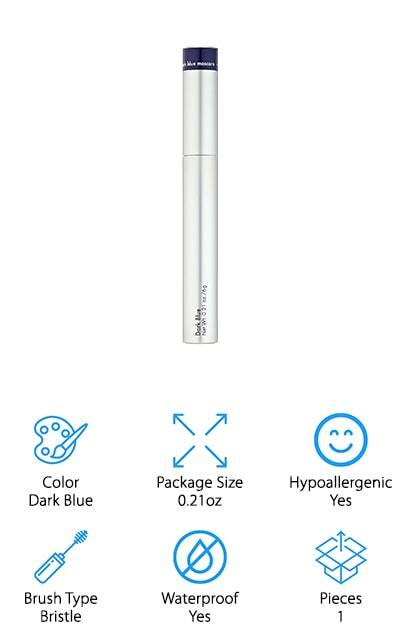 This dark blue mascara by blinc offers unique features as well. It comes in a variety of colors including very black and brown. Pick up all of the colors so you always have the right mascara for the job. This mascara works to form small tubes around each of your eyelashes. They bind to the hairs so they won’t smudge, clump, run, or flake off even if you mistakenly rub your eyes. It stays on all day and will work great for your evening look as well. It lasts all day. When it’s time to remove it, you can take it off without makeup remover by sliding the tubes off of your lashes. It works! It’s not conventional mascara at all, and you aren’t painting your lashes. If you’re looking for something unique and new, reach for this blue tube mascara. You won’t have to reapply it while it’s still on your face, even after working out.